So it’s been awhile since I’ve seen anything at J.Crew Factory that’s caught my eye. A few weeks ago I had a 30% Gilt City coupon for J.Crew Factory and saw a few dresses that caught my eye – the Factory Boucle Dress in Dublin Green and Short-Sleeve Basketweave Dress (the style looked very similar to one I have from last year and love). My major gripe with the Factory website these days is that you can’t see the dresses on real models. The Boucle dress was billed as falling to the knee and the Short-Sleeve basketweave dress as falling above the knee. I decided to try a size 12 in both of these, as I have the 14 in last year’s basketweave dress and it is a bit big. The reviews on this year’s version was said that it runs large. Out of the package, the dress looks very similar to last year’s version. The dress is 100% woven cotton with an acetate lining. 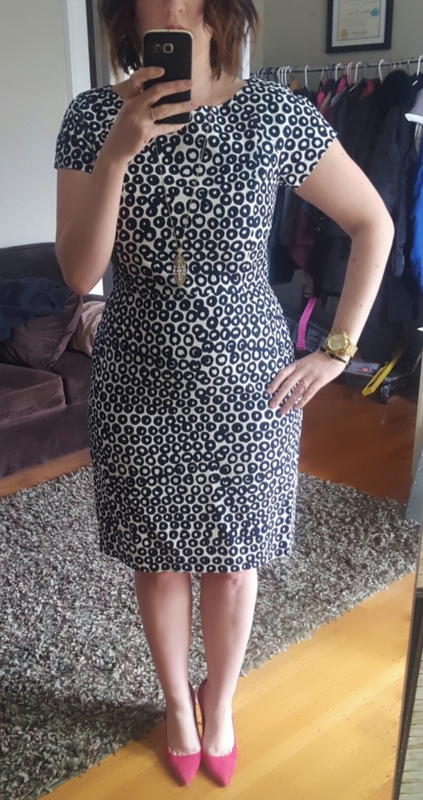 I’m usually a 12 in dresses but sometimes a 14 in factory and this dress is generous. I couldn’t go down another size with my hips but I do have room in my midsection and in the shoulders. I would say if you don’t have as many curves you could size down a size. The dress hits at my knee (I’m 5’8″). 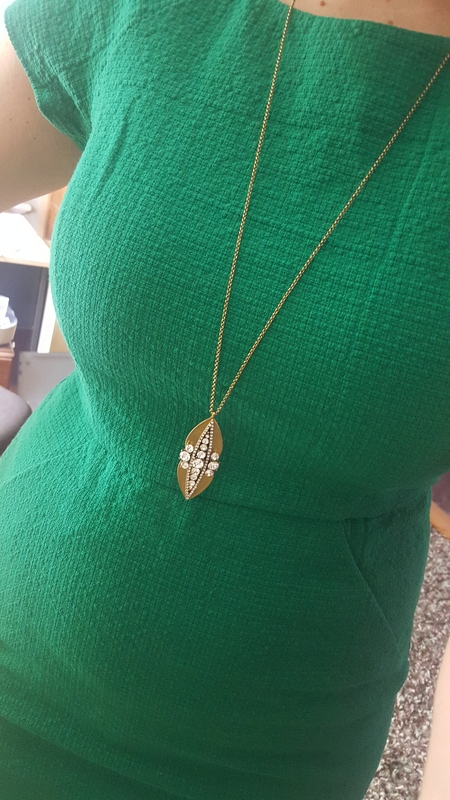 The dress has a wider neck so I did have to push my bra straps over so they weren’t peeking out (there aren’t any bra keeps either). I think people will either love or hate the uneven circles, they don’t bother me and I know this will get a good spring/summer rotation in my work wardrobe. The green boucle dress is a little more form fitting in the size 12. I like the color – I haven’t been able to stop thinking about a Factory dress in this color that I passed up last summer. I found this dress to be shorter than the basketweave dress and you can see it’s a little more fitted. I may try a pair of spanx under this dress to try and smooth out my hip area. The boucle dress is 84% cotton, 12% polyester, 4% elastane with a polyester lining. The front seams are not pockets. 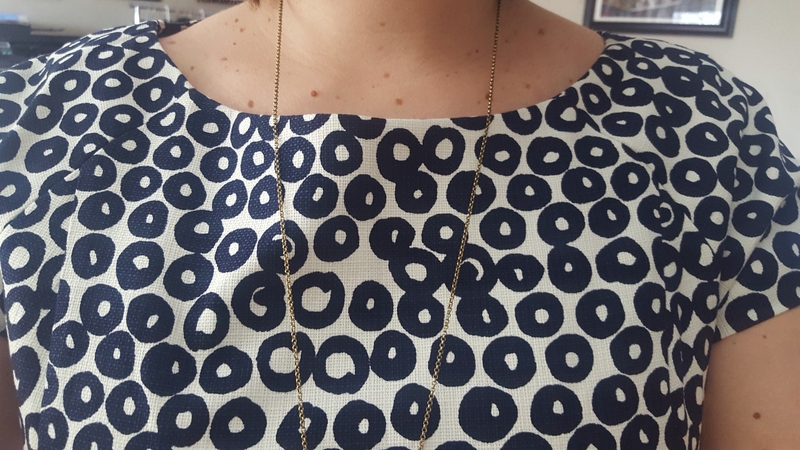 Calling this dress boucle is a bit of a stretch – it’s more of a textured cotton and there aren’t any actual loops in the fabric – which from a fabric snag potential is a good thing. This dress will look even better once it’s ironed. Both dresses claim to need to be dry cleaned – they may be washable at home but I’m usually not too adventurous when it comes to these things. I like that I will be able to wear both dresses with a blazer or cardigan and the navy/white dress will work with a lot of shoe/cardigan color combinations. So, have you done any shopping at J.Crew Factory lately? What do you think of the dresses? Would love to hear what you think and thanks for visiting! Hi Anne, in case you wanted to refer me on Boden, my email is tatsy74@yahoo.com — their refer a friend incentive gives you a $15 coupon and a 15% discount for me. I think you more than deserve it since I’m interested in that dress b/c of you! Anyways, if it’s too much of a hassle I understand, no worries!! I enjoy your posts, blogs both here, on Insta & JCA! (OMG, i’m so embarrassed, i entered the WRONG value in the Captcha below, hahaha! Ack! Simple math! !